For a copy of GLGA’s updated Illinois Sales Taxability Matrix – a FREE Members-Only benefit – please contact Bill Gibson at bgibson@glga.info or Sharon Flick at sflick@glga.info. February 12, 2018 – The Illinois Department of Revenue is awaiting the Governor’s office approval to sign off on preliminary rule-making for implementation of the regulations governing the Graphic Arts sales tax exemption, including frequency requirements for filing of the ST-587. Presently, an ST-587 must accompany every non-taxable purchase in order for your company to take the tax credit. Soon the Illinois Joint Committee on Administrative Rules (JCAR) will open discussion on these rules and will be seeking input from Illinois companies that utilize this tax exemption. Download the current ST-587 by clicking here. Companies that qualify should submit their thoughts or ideas in writing to Bill Gibson, Illinois Director of GLGA, at bgibson@glga.info. I will see to it that this information is filed as soon as public comment is open. November 1, 2017 – Now that Graphic Arts in Illinois is rolled into Manufacturing Machinery and Equipment, you will have to complete a ST-587 for EACH purchase as there is no blanket certificate for manufacturing machinery and equipment. Download the current ST-587 by clicking here. If you have specific questions on the reinstated law, feel free to contact GLGA Illinois Director Bill Gibson at (312) 704-5000 or bgibson@glga.info. Or, you can contact Benjamin Sutton at (217) 524-4690; Benjamin oversees Graphic Arts at the Illinois Department of Revenue in Springfield. July 6, 2017 – After a hard fought legislative session, I am pleased to announce that the Graphic Arts sales tax exemption has finally been restored! The credit is now PERMANENT and exempt from automatic sunset laws. Due to our efforts in Springfield the Graphic Arts sales tax exemption became part of the Manufacturing Machinery & Equipment exemption effective July 1, 2017. This is a HUGE win for all GLGA members. The law now allows a permanent sales tax exemption for graphic arts and printing equipment, which at a MINIMUM is equal to $6,254 for every $100,000 spent on covered equipment. The state legislators became aware of our industry through member visits to Springfield, letters, emails, and my presence in the capitol to tell our story and give a clear understanding of who we are along with our partners (the Illinois Press Association and the Illinois Manufacturers Association). To date the state has more than 2,300 print manufacturers that employ 55,000 Illinois workers and ship more than $9 billion annually in product. Carrying the GLGA banner in Springfield on behalf of all printers in Illinois has been, to say the least, a committed task that your Board of Directors has supported since the Illinois Graphic Arts exemption sunset on August 30, 2014. I have been on top of this issue before the sunset came into effect, and with your help we have made a significant impact with our lawmakers in Springfield letting them know our industry is strong in Illinois and we have a voice. Funds collected from Illinois members of GLGA along with a line item in the budget have allowed me to work with our state legislators in getting back the Graphic Arts provision. I also positioned our association with the Illinois Press Association, specifically Josh Sharp, and the Illinois Manufacturers Association in an alliance to form the Advance Illinois Manufacturing Coalition (AIM), to make our voice stronger in Springfield and push for the extension of several critical tax incentives including the Graphic Arts provision. I will be working with Andrew Klemens at BKD and the Illinois Department of Revenue to assist member companies for clarification for printers and print manufacturing companies that purchased equipment after July 1, 2017. Once I receive guidance, I will provide that information to you. Again, I thank each company and the GLGA Board of Directors that stepped up to the plate with funds, emails, letters and phone calls to legislators which helped to earn this victory in Springfield. June 6, 2017 – The results are in, and they’re not pretty. Members of the Illinois printing community were recently asked to provide information related to two key questions. 1) What is the cost of the equipment that you are holding off on purchasing since the Graphic Arts production credit expired? 2) How many employees would you have added if you purchased this equipment? The responses reveal that Illinois’ print industry has put on hold a staggering $46.6 million in equipment purchases since the expiration of the Graphic Arts tax credit in 2014. Even worse, Illinois printers would have added 204 more jobs during that time if legislators in Springfield had acted to restore the credit. The Illinois printing industry has been affected by the crippling loss of the sales tax exemption and manufacturers purchase credit ever since both expired in August 2014. GLGA has been leading the battle in Springfield to have both critical incentives restored. As a member of the Advance Illinois Manufacturing (AIM) coalition, a diverse group of business industries across the state of Illinois, GLGA is advocating for modern and permanent extensions of four critical tax incentives that will provide stability and predictability for job creators. Among the key points of AIM’s Legislative Agenda are reforming the Manufacturers Purchase Credit to make it permanent by merging it into the Manufacturing Machinery and Equipment Exemption and reforming the Graphic Arts Sales Tax Exemption to make it permanent. AIM also wants to have printers reclassified as manufacturers; Illinois remains the only state in the country to not recognize printing as a manufacturing activity. For more information about the fight to restore Illinois’ lost sales tax exemptions and manufacturers purchase credit, contact GLGA Illinois Director Bill Gibson at (312) 704-5000 or at bgibson@glga.info. Diverse Illinois Coalition Supports Permanent Tax Solutions to Provide Stability and Strengthen Job Creators; Support HB 5717! March 3, 2016: The fight continues to restore Illinois’ critical graphic arts sales tax exemptions. A diverse group of business industries across the state of Illinois has launched a coalition committed to advocating for modern and permanent extensions of four critical tax incentives that will provide stability and predictability for job creators. Advance Illinois Manufacturing includes members in the manufacturing, agriculture, printing, biotech and other important sectors of the state’s economy. The AIM Coalition is advocating for permanent tax solutions to ensure that a wide variety of industries in Illinois remain competitive in the marketplace. AIM is hoping the legislature will support a series of legislative measures that must be adopted to create a secure business environment to further existing manufacturing interests as well as future investment. Among the four key points of AIM’s Legislative Agenda – HB 5717 sponsored by Rep. Zalewski are reforming the Manufacturers Purchase Credit to make it permanent by merging it into the Manufacturing Machinery & Equipment exemption; and reforming the Graphic Arts Sales Tax Exemption to make it permanent. Both tax incentives sunsetted in August 2014, significantly affecting the printing industry in the state. Coalition Members include Illinois Manufacturers’ Association, Illinois Science & Technology, Great Lakes Graphics Association, iBio, Southwestern Illinois Employers Association, Illinois Petroleum Council, Illinois Press Association, Taxpayers Federation of Illinois, Illinois Coal Association, Chicagoland Chamber of Commerce and Choose Du Page Economic Development Alliance. A delegation of Illinois printers and equipment manufacturers went to the State Capitol in Springfield, IL, on April 23, 2015, to fight for the reinstatement of our industry tax incentives. From left: Derek Gordon, Ryobi MHI Graphco; Sen. Kyle McCarter (R-Vandalia); Sen. Dale Righter (R-Mattoon); and John Kingery, Kingery Printing. A delegation of Illinois printers and equipment manufacturers went to the State Capitol in Springfield, IL, on April 23, 2015, to fight for the reinstatement of our industry tax incentives. 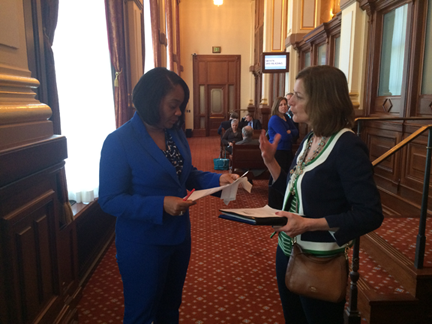 From left: Sen. Kimberly Lightford (D-Westchester) meets with Mary Richards Lawrence, Richards Graphic Communications. The future of your company and Illinois’ print industry depends on everyone’s active involvement. Let’s work together to bring back what we have lost and further our position as a necessary industry to the rebuilding of the State. Tell your legislators to stop their political budget battles and to get back to making Illinois a hospitable state for the printing industry. If you need your state Senator’s and Representative’s contact information, you can obtain names, addresses, and phone numbers at the Illinois State Board of Elections’ District/Official look-up website. Download a sample letter to your local legislators. Download a FAQ sheet with talking points.